There are a few times a year that I post a recipe that doesn’t include macro or calorie information. It’s usually for a special occasion or something that I’m giving as a gift. Today is one of those recipes. I’m a homemade gift giver. Those kinds of things are fun to me since I get a chance to make something that has meaning and that the recipient hopefully enjoys as well. Years ago when I lived on the East Coast, my Mom would come over to visit and I’d make chocolate chip scones. For those of you who have lived your life in a No Scone Zone, scones are similar to cut biscuits but they are sweeter and usually flavored. I love scones, especially the pumpkin and chocolate chip ones. My dad however is partial to lemon. He loves lemon pies, lemon cake, lemon squares. What better way to celebrate his birthday than with something lemon. So I made lemon scones for him. Not ones that are cluttered up with poppy seeds. Poppy seeds are for muffins and waffles, LOL. Scones are meant to be poppy seed free. To make them a bit more festive and fun, I used a heart-shaped cookie cutter to cut them out. You can also use a round cutter or a drinking glass. In a pinch you can also just cut them into large triangles with a knife and bake them that way. Preheat your oven to 375 degrees. Measure your dry ingredients into a large bowl. Add the shortening and cut the shortening into the flour mixture with a fork until it begins to form large crumbs. You’re aiming for a dry, crumbly look. Add the soy milk and vanilla and continue to mix until the dough begins to come together into a ball. Press or roll the dough out into a rectangle about 3/4 to 1 inch thick. 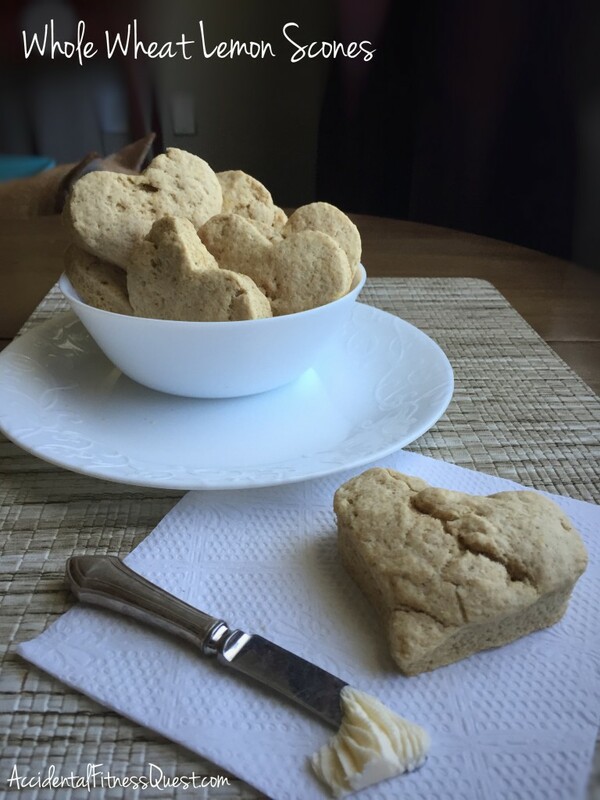 Cut into large biscuit shapes using a cookie cutter or drinking glass. Place the scones onto a cookie sheet. Roll and press the scraps, as needed, to continue cutting scones. Bake at 375 for approximately 15-17 minutes until browned on the edges. Remove from oven and serve warm with butter. Makes about 8 large scones. With the exception of the butter flavored shortening, I did try to use relatively natural and whole food ingredients. The shortening was in place of butter due to The Kid’s dairy allergy. You can use real butter instead to make them decadent. Lime or orange zest also works well in this recipe if you want to mix up your flavor.